On Friday, the Kenya Television Network (KTN) reported that a man was forcibly circumcised after his first wife exposed him following a quarrel. Thousands of people gathered at Chwele market to witness the cut, and the paramilitary group (GSU) had to step in to control the lively crowd. Bukusu culture dictates that the man should wait four months before community leaders advise him about manhood (despite the victim having two wives and allegedly, 11 children). Erica Morales and her husband Carlos of Phoenix, Arizona had spent years trying to conceive. After IVF treatment last year, Erica found out she was pregnant with quadruplets. A month before her due date, she was rushed to the hospital with high blood pressure. The doctors checked her in to monitor her and not long after, she delivered the three girls and one boy. 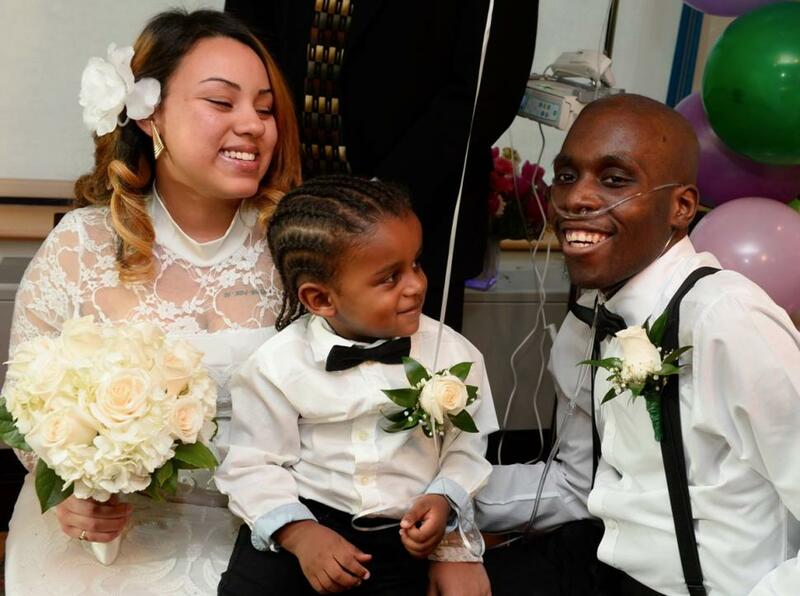 Heartbreakingly, she died hours after delivery due to unknown reasons. 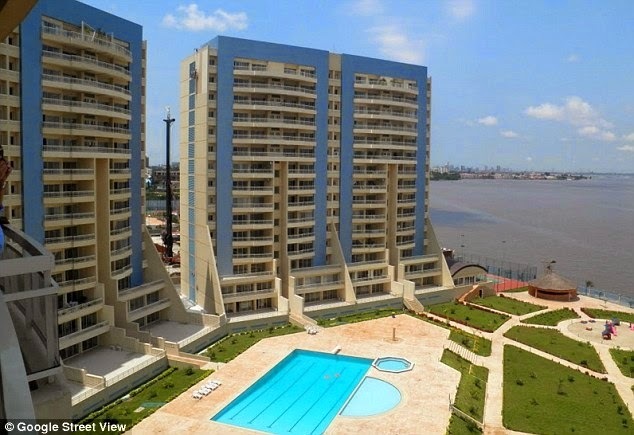 I am a regular visitor to the Northern Foreshore Estate, Lekki. When I was showed this document (see below) as one of the achievements of the president in the North East, I was immediately concerned about the similarities with the Northern Foreshore Estate, in Lekki. You can compare pictures of the estate against the image in the document prepared by the office of the Chief Economic Adviser to President Jonathan, Dr. Nwanze Okidegbe. Reno Omokri and his goons have been spreading this image as one of the successes of the president in the North East but it is indeed a private project in Lekki, Lagos. Residents or visitors to Northern Foreshore Estate, Lekki will immediately notice the semblance of the image on the government document with the estate. It is indeed not a semblance, it is the estate as we have since established. God Answers All Prayers? Strippers Praying Together Before Climbing The Pole. Do you think this photo is a good or bad thing? Why? Should there be a problem with exotic dancers praying before stripping on stage for men in a club? Surely God answers all? However, I strongly believe that God does hear the prayers of sinners, and we are all technically sinners through our thoughts, actions and deeds e.t.c. Islamic State have released images of their fighters carrying out a series of horrific executions. 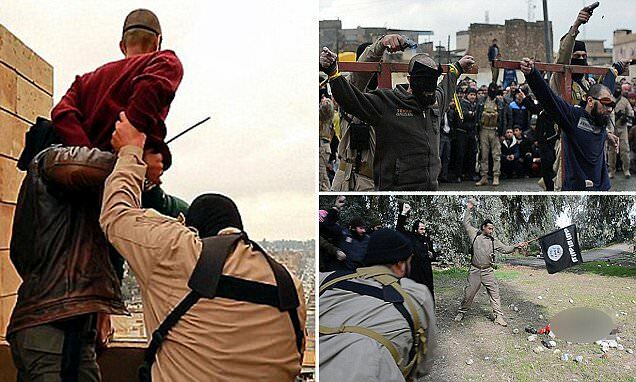 They show men being hurled from a roof for being gay (left), a woman accused of adultery being stoned to death (bottom right) and two alleged 'bandits' who were tied to crosses before being mercilessly shot (top right). It seems you have always loved fashion? I have always loved fashion and African fashion in particular. I was the President of Black Students Union when I was in high school. One of the mandates for my presidency was to create events that would help connect African Americans to the African heritage. It was mandatory for you to wear something African to every event. I found myself making all sorts of African wears and dresses. But you hadn’t even visited Africa then? No. I was just connected. I always had this drumming in my ear even when I was a little girl. I would always hear the sound ‘boom boom boom’ in my ears. It was the sound of a drum. It was an African rhythm. I would tell my parents about it. My father told me one day that my ancestors were the ones calling me back home. So did the drumming stop when you got to Africa? Oh yes it did. When I first got to Nigeria, I knelt down as soon as I stepped out of the aircraft, I prostrated and I kissed the ground. I was so drawn to being home and I was happy I kissed the ground. I went to the slave dungeons in Cape Coast, Ghana. I was there with the Association for Study of African Classical Civilisation. We had a symposium and part of our tour was to go to the slave dungeon. The women among us went to the prison where the females were kept. There was a door of ‘no return’ that all of our ancestors went out through when they were sold. They said anybody who went out from that door never came back home. I was supposed to go with everybody else after that session but I didn’t. When veteran actor Adebayo Salami marked his 50 years on stage recently, his friends and colleagues took turns to tell how he impacted positively on their lives. Among those who spoke was popular fuji musician, King Wasiu Ayinde Marshal, who said his dream was to become a movie star until he was advised by Oga Bello to be a musician. He said he would forever be grateful for the advice which has helped to shape his life. In a bid to avoid being caught up in violence that may erupt after the February 2015 general elections, politicians, many chief executive officers/ chairmen of companies, top businessmen and wealthy Nigerians have started moving their families out of Nigeria. 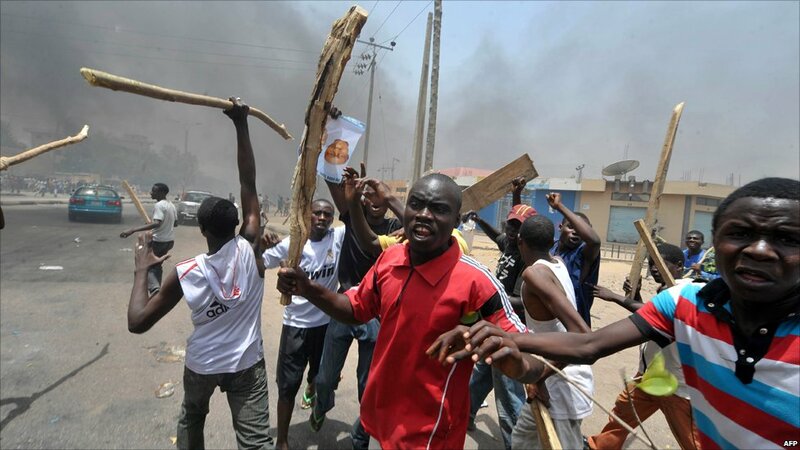 Over 800 persons, including 10 members of the National Youth Service Corps were reportedly killed in the North during the violence that trailed the 2011 general elections. Investigations by Saturday PUNCHshowed that some apprehensive politicians and top members of the business community started relocating members of their families abroad late last year. Many, it was learnt, are still moving their families out of the country. According to findings, medical check-ups, short vacation, among others, are being cited by wealthy Nigerians as reasons for their trips. A husband drove an electric drill into his wife’s brain before stabbing her in the eye with a screwdriver, a court heard. A jury was told how Tahi Harroba Manaa, 37, inflicted 270 injuries on his 28-year-old wife Sara al Shourefi while the couple’s four children, aged two to eight, were in the house in Sheffield, Yorkshire. Manaa is alleged to have attacked his wife with items including an electric drill, a screwdriver, metal bars and a knife in a 105-minute assault. Elder Statesman and a former Federal Commissioner for Information, Chief Edwin Clark, has called on the national leadership of the Peoples Democratic Party to sack former President Olusegun Obasanjo from the party. Clark, who spoke with journalists at his residence in Abuja on Friday, accused the former chairman of the Board of Trustees of the party of working with the opposition against President Goodluck Jonathan. Anyone who can afford the good things of life will find living in Banana Island a foretaste of what paradise looks like. It is a statement in opulent living and lifestyle. quietude and untainted environment is a major attraction as well. Beautiful trees are also planted in canopy form to serve as umbrella and to supply fresh air. Former President Olusegun Obasanjo on Friday blows hot again, saying it is “performance” and not “party loyalty” that informed his choice of whom to support in the forthcoming general election. Obasanjo, who is a former chairman, Board of Trustees (BoT) of the Peoples Democratic Party (PDP), did not hide his intention to vote for the All Progressives Congress (APC) governorship candidate in Ogun state, Senator Ibikunle Amosun, in the February 28 governorship election in the state. All Progressives Congress (APC) National Leader Asiwaju Bola Ahmed Tinubu has lambasted the Peoples Democratic Party (PDP) for calling on the Independent National Electoral Commission (INEC) to disqualify APC presidential candidate General Muhammadu Buhari over certificate issues. Tinubu, who spoke yesterday during the APC’s rally in Abeokuta, the Ogun State capital, described PDP as a “shameless” party. He said: “I laugh when the incapable government of Nigeria, the Poverty Development Party has nothing to say; they have the temerity to question the educational qualification of General Buhari and look for his certificate. Aaaaaaa! (laughter) Shame on them… what an insult!. The Economic and Financial Crimes Commission, EFCC, on Wednesday, January 14, 2015 arrested three suspected internet fraudsters in Port Harcourt, Rivers State - Okpekereke Timothy, Stanley Odjighere, and Teminor Karo. The trio are part of a syndicate arrested over allegations of conspiracy, internet scam and stealing from one of the new generation banks to the tune of N806, 208,000.00 (Eight Hundred and Six Million Two Hundred and Eight Thousand Naira). Forty others are still at large. The Goodluck/Sambo Support Group has accused two ministers from Kano and the state Peoples Democratic Party, PDP, gubernatorial candidate of refusing to identify with President Goodluck Jonathan by shunning his posters. Following recent widespread smear campaigns against the presidential candidate of the All Progressive Congress (APC), General Muhammadu Buhari (rtd), over his education, training and qualifications, SaharaReporters has unearthed a letter written by the United States Army War College, Pennsylvania praising Buhari’s intelligence and brilliance throughout his stint as a fellow at the prestigious military academy. 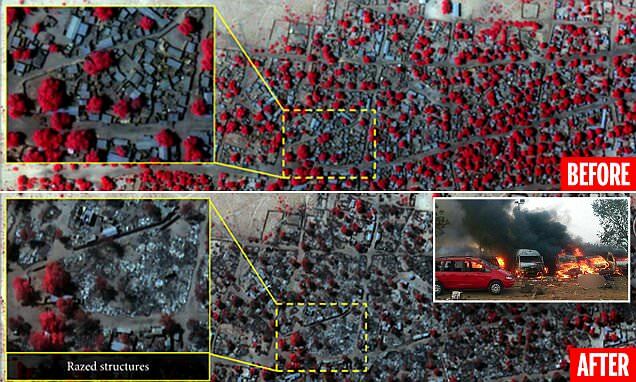 WARNING GRAPHIC CONTENT: The red clusters seen in this infra-red satellite photo (top) show the Nigerian village of Doron Baga bustling with life on January 2. Another image taken just five days later (middle) shows the area devoid of life after Boko Haram raided the village - killing thousands of people and destroying their homes. Those who survived the assaults on the north-eastern towns of Baga and Doron Baga described how they escaped over the dead bodies of people who were 'killed like insects'. Amnesty International says one of the cities was virtually 'wiped off the map' in what they claim is Boko Haram's deadliest ever attack in the country. Fresh facts have emerged regarding the reasons the Peoples Democratic Party (PDP) in the State of Osun opted for a smaller venue to host the party’s presidential campaign team in the centre of the town, instead of the city stadium. of large turnout at the rally. Unlike in some PDP-dominated states like Akwa-Ibom, Enugu, where rallies were held at the stadia, the one in Ibadan was held at the Mapo Hall area, while that of Osogbo was held at the Nelson Mandela Freedom Park. The ranks of the Peoples Democratic Party in the House of Representatives further depleted on Wednesday as eight more members defected from the majority party. Four of the defectors joined the rival All Progressives Congress, giving indications that the leading opposition party had gained the control of the House as the majority party. The All Progressives Grand Alliance gained two of the defectors, while the Peoples Democratic Movement and the Social Democratic Party each gained one, bringing to eight the total PDP defectors on Wednesday. The Ambassador Yusuf Maitama Sule-led Northern Elders’ Forum, and the Arewa Consultative Forum, have endorsed the All Progressives Congress’ Presidential candidate, Maj. Gen. Muhammadu Buhari (retd. ), and his running mate, Prof. Yemi Osinbajo, for the February election. The NEF and the ACF in separate statements in Kaduna on Wednesday said that they would ask all northerners and indeed Nigerians to support Buhari because he was a better candidate than President Jonathan Goodluck, the candidate of the People Democratic Party in the February 14, presidential election. According to a communique signed by the ACF National Publicity Secretary, Alhaji Muhammad Ibrahim, the Forum noted that it was part of its policy to support northerner in any presidential election. War Of Words on Instagram: Guy Puts Controversial Socialite On Blast, Calls Her A Runs Girl!!! Huddah was the first contestant to leave the House in last year’s Big Brother Africa. Now this guy is claiming he had a one night stand with the boss lady who many believe is into some real business. .
Huddah had initially claimed that the guy was just a fan that demanded to take a picture with her. But her story changed when the guy posted the second picture they took together after an alleged night of heavy firing. 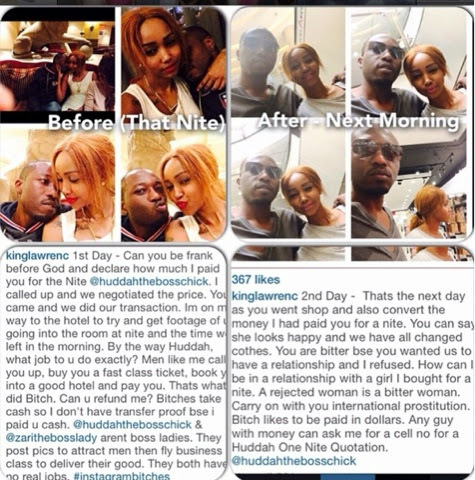 Here is Huddah's initial version of the story: . 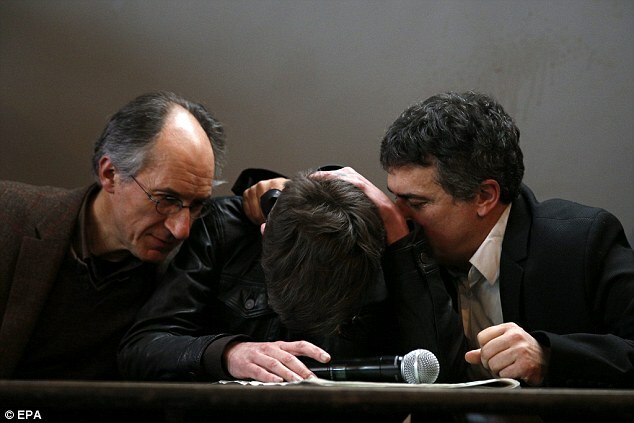 Charlie Hebdo's cartoonist broke down today as he explained his reasons for drawing the Prophet Muhammad on tomorrow's controversial front cover. The image depicts the Prophet shedding a single tear and holding a sign which declares: 'Je Suis Charlie'. Above the figure, who is drawn in a comic style wearing a turban, the text declares: 'Tout est pardonné (All is forgiven)'. Weeping repeatedly during an emotional press conference, cartoonist Renald 'Luz' Luzier said the image represented 'just a little guy who's crying'. He expressed his feelings to several of his aides following a late evening meeting with President Jonathan at his home in Abeokuta. Both men were in the presence of Pastor Adejare Adeboye, the General Overseer of the Redeemed Christian Church of God, and Bishop David Oyedepo of Winner’s Chapel. 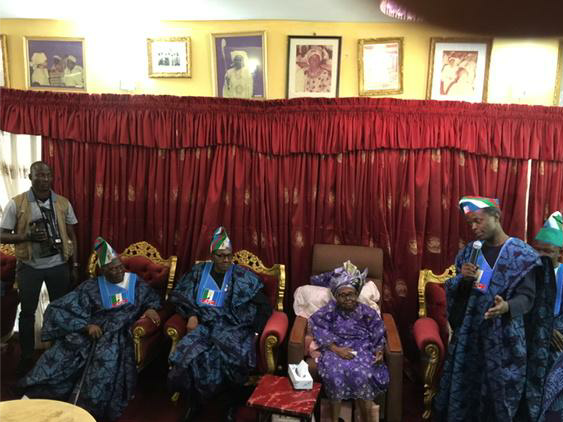 To make matters worse, a few hours after meeting with Jonathan, Obasanjo met with leaders of the All People’s Congress (APC) and their presidential candidate, Muhammad Buhari, where he affirmed he will support the best candidate regardless of party affiliation. 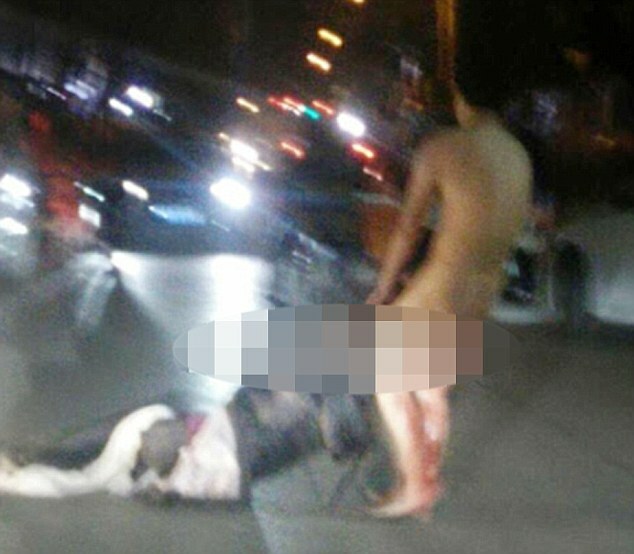 Armed police moved in on a naked woman after she stripped and lay in front of an ambulance to stop it taking her husband's suspected lover to hospital. Zhang Shih, 38 - from Linyi, Shandong province, eastern China - allegedly ran down neighbour Wang Lu and her four-year-old daughter in fury over over the suspected fling. But when emergency services arrived she did everything she could to ensure neither was able to get swift, life-saving treatment - even as officers pointed guns at her naked body. This is what happened when two male radio presenters walked down a street in Luton holding hands. Iain Lee and Justin Dealey, from BBC Three Counties radio, had hoped to receive a more enlightened reception but the response was, sadly, quite different. Residents gave the pair strange looks and made comments as the pair walked hand-in-hand down the street. Lagos State Governor, Mr. Babatunde Fashola, SAN (middle), widow of Late Prophet Gabriel Olubunmi Fakeye, the Spiritual Leader & Founder, Cherubim and Seraphim Movement Church Ayo ni o, Mrs. Grace Fakeye (2nd left), children of the deceased - Mr. Olumide Fakeye (2nd right), Miss Tosin Fakeye (left) and Miss Imelda Fakeye (right) during the Governor’s condolence visit to their family residence at Dopemu, Lagos, on Monday, January 12, 2015. Humility + Wisdom + Faith + Diligence = Success...."For whoever exalts himself will be humbled, and he who humbles himself will be exalted." A friend of my tells the story of a time when his wife was out of town and he had to take care of their three small children by himself. Being a psychologist, he was usually pretty good with them and understood their needs. On this particular morning, however, their little girl was pushing him past the limit. He was trying to get them off to school, and she was lollygagging. He nagged her a few times but she did not pick up her pace. Slowly, he began to get angry. He could hear her in her room, still playing and not getting ready at all. Her defiance was really irritating him. He was on his way in there to let her have it when he stopped in his tracks. If this were one of my clients, what would I do? he asked himself. I would find out what is causing this behavior. He thought about it for a moment, and then he had it. She usually had this time in the morning to spend with her mother. He walked into his daughter's room, stooped down, and with his hands on her shoulders, looked her right in the eye. The hostility between President Goodluck Jonathan and former President Olusegun Obasanjo worsened Monday as the former President sneaked out of his palatial building in Abeokuta, immediately Jonathan arrived the state capital. Obasanjo was driven out in a black SUV through a private gate in his house. The Managing Director of National Mirror, Kafilat Ogbara, has resigned. Ogbara resigned in circumstances that confirmed a face-off with the Publisher of the newspaper and Chief Executive Officer of Energy Group, Barrister Jimoh Ibrahim, though some sources said she was sacked. The resignation comes one year after her appointment, which sparked off controversy in the organisation. It was learnt that Ogbara could not cope with the reality of inconsistent salaries and loss of Ibrahim’s confidence. Many Nigerians especially members of the Celestial Church of Christ(CCC) Calvary Parish 1 Ogba Aguda, Lagos, in the early hours of Sunday, January 12, 2014 when calls started hitting their phones that the great Shepherd, Superior Evangelist (Dr.) Joshua Akande Ogunorunlayede (CMA, ELMA, GCHSA, JP) has passed unto the great beyond. Superior Evangelist (Dr.) Joshua Akande Ogunorunlaiyede died on Saturday January 11th at the ripe age of 72, is the founder of the Celestial Church of Christ, Calvary Parish 1-6 with Headquarters at CCC, Calvary Parish 1. The bitterness of mind was precipitated on the fact that the 72 years old shepherd of one of the biggest parishes in the Celestial fold was an embodiment of humility and mercy while he was alive and many of his flocks loved him to bits; shock because, the man of God never showed any sign of sudden death in the early part of the year before his demise at 10:40pm on Saturday January 11 at a private hospital at Ifako Ijaiye area of Lagos, South West Nigeria. Late Toto Abuga's Wife Says - "No Man Can Meet My Standard For Marriage"
Biola Alade Olatunji (Nee Oredein) is a popular celebrity lady in the black community in the United Kingdom and Lagos, South West Nigeria. She is equally influential in Ibadan the capital of Oyo state and largest city in West Africa which is her place of birth and early years. The very versatile international business woman came into limelight few days after her equally famous husband, Alhaji Lookmon Alade Olatunji aka Toto Abuga, a Lagos socialite was murdered in the evening of Saturday June 8, 2008 on his way back from the United Kingdom. 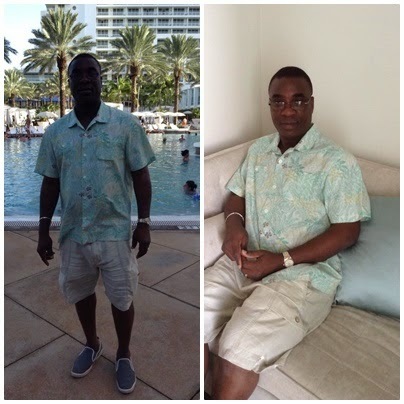 Toto Abuga who is very famous with top Lagos musicians especially Fuji Music Czar, King Wasiu Ayinde Marshal (K-1 De-Ultimate) on account of his generosity to them was killed while driving out of the Murthala Muhammed International Airport, Lagos, South West Nigeria few hours after his arrival from London. He was killed around Oworonshoki area of Lagos. Part 1: Late Iyalode Adunni Bankole’s last memoirs | “Why People misunderstood me” + Bitter Experiences of her 30 yrs. Marriage exposed! Before her Saturday January 3rd sudden demise hours before the marriage of her second daughter, Mopelola, Iyalode Adunni Bankole one of Nigeria’s prominent high society women who contributed immensely to the development of the Nigerian entertainment and social circle in the last 25 years told Asabeafrika some deep seated events that characterized her 30 years union with her Egba, Ogun State born husband, Chief Alani Suara Bankole. The influential Egba born philanthropist of repute and woman of enterprise was the 4th and youngest wife of Chief Bankole, an equally famous industrialist of Egba stock. For 30 solid years this very beautiful woman with Owu blood running in her vein was married to the Egba chief as his fourth and youngest wife. 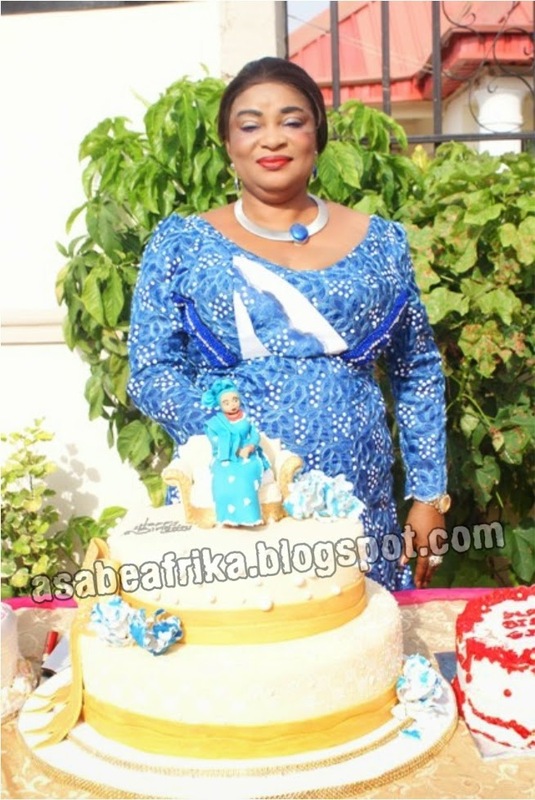 Late Nigerian high society woman and one of the most influential women in the Lagos and Ogun state social circle, Chief Mrs. Adunni Bankole clocked 55 on Saturday March 29th, the same day a national leader of Nigeria’s major opposition party- All Progressive Party (APC) Asiwaju Bola Ahmed Tinubu was equally celebrating 62. While people from all walks of life gathered at the Victoria Island, Lagos-South West Nigeria based Eko Hotel and suites in honor of the veteran politician: Jajo, a community in Gberigbe area of Ikorodu a suburb in Lagos witnessed the surge of dignitaries from all walks of life who stormed the Praise Courtresidence of Chief Mrs. Adunni Bankole to give her a befitting honor on the auspicious occasion of her 55th birthday. It has always been the nature of the celebrant to throw her doors open every year for the occasion. Two years ago, some top friends hosted her at Protea Hotel, Ikeja, Lagos while last year’s event had the famous Opebi-Ikeja based Chinese Restaurant as location. But this year, Mrs. Bankolewho is a very sociable personality with a large heart for everybody that comes her way, dragged the high and mighty to her deep-down Lagos’ suburb, Ikorodu home and the big people never mind to yield her invitation despite the long distance. Leading the cream of high level personalities who graced Adunni Bankole’s 55th is Chief (Mrs.) Bola Obasanjo, wife of former President and elder statesman Chief Olusegun Obasanjo who represented her husband at the occasion, while others like Senator Kola Ogunwale, Aare Remi Bakare and a host of other very important Nigerian politicians and business men and women gathered for a soiree of praise worship, singing, eating and merry making with one of the most influential woman in Yoruba land who is also the Iyalode of Gbagura land in Abeokuta, Yeye Asoludero of Jajo land in Ikorodu and Yeye Mokun of Oke-Odan in Egba kingdom. The burial ceremony of Chief (Mrs) Adunni Adetayo Bankole is billed to hold this week. Adunni Bankole (née Adebowale) a prominent matriarch of the Nigerian social establishment, was the wife of Ogun State popular politician, Chief Olayiwola Alani Bankole, and step mum of the former Speaker of the House of Representatives, Hon. Dimeji Saburi Bankole. She died on Saturday, January 3, 2015, at a private hospital in Ilupeju, Lagos State after a protracted battle with diabetes and heart- related ailment. She was aged 55. Her death occurred, just few hours before the commencement of the wedding ceremony of her second daughter, Mopelola Zeenat. The funeral arrangement kicks off on Monday, January 12? with a special prayer at her family residence in Oregun. On Tuesday, January 13, the Christian Wake Keeping and Praise Night session will be held at Anchor Events Centre, Agidingbi, Lagos. On Wednesday, January 14, the Funeral Service will also hold at the Anchor Events Centre. The internment follows at a private cemetery in Lagos. Bankole, who held the title of Iyalode of Gbaguraland, Abeokuta, till her death, is survived by her husband, an aged mother, siblings, four loving children- Oluwatoyin, Mopelola, Owolabi Jnr and Modesola, and a grandson, Oluwadarasimi. Iyalode Bankole had many titles in her kitty. She was Iyalode of Gbagura and Iyalode of Ojo and at the last count had 15 chieftaincy titles. She was also the United Nations Ambassador for Peace. Many did not know that she was also the national grand-matron of the Performing Musicians Association of Nigeria (PMAN). Shortly after his debut single in the music scene; Nollywood actor-turned-mu­sician, Gabriel Afolayan, has released yet another musical video from his collections ti­tled “Awelewa”. Excited Gabriel took to his Instagram page to announce the release of his new work which was co-directed by Kunle Afolayan. The popular Balogun market in Lagos Island, Lagos State was today, January 12, the scene of a raging inferno. The fire is believed to have started in the early hours of the morning and has destroyed four houses, five plazas and a bank building in the area. The cause of the fire is unknown but men of the fire service have since arrived at the scene to tackle the blaze. This comes after a fire also razed a settlement in Ebute Metta, beside the Third Mainland Bridge yesterday night. A former Vice President of Nigeria, Alex Ekwueme, has lamented that despite being a founding member, he has been subjected to “humiliation and neglect” by current leaders of the Peoples Democratic Party, PDP. Mr. Ekwueme, who said this during an interview with the Sun Newspapers, also asked President Goodluck Jonathan to accord him his due recognition as a founding member of the PDP and a former Vice President of Nigeria. The All Progressives Congress (APC) has accused the Jonathan Administration of planing to postpone next month’s general elections. This was made known by Alhaji Lai Mohammed, the National Publicity Secretary of the All Progressives Congress (APC) in a press conference. 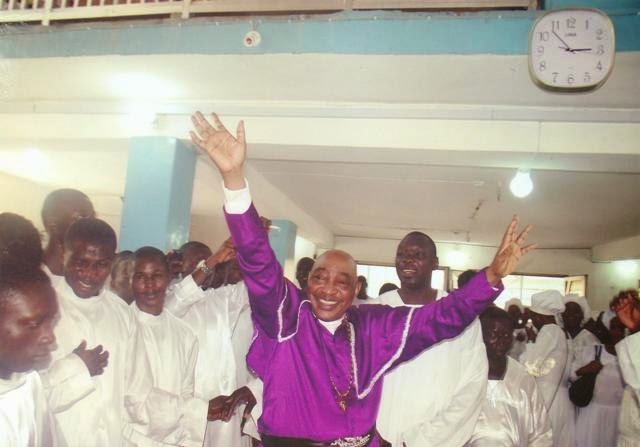 Televangelist Special Apostle Prophet (Dr) Gabriel Olubunmi Fakeye, General Leader of the Cherubim and Seraphim Movement Church (Surulere) is Dead. Special Apostle Fakeye,78, was said to have died of an undisclosed ailment at the Lagos University Teaching Hospital LASUTH. Other sources, however, indicated last night that Fakeye who would clocked 79 years on March 11, 2015 died in a US hospital. Bola Amole, Proprietor Of BIMS African Foods Peckham London Died In Her Sleep. Nigerian community in London was thrown into mourning today with story of the sudden death of Mrs Bola Amole, who is the proprietor of BIMS African Foods Limited based in London, United Kingdom and BIMS Afro Continental located in Lagos, was said to have died in her sleep, at her home in Nigeria. When Rihanna first launched her singing career, she may have dreamed about landing the kind of fame and fortune that would allow her to buy a Picasso. But pop star wannabe Abimbola “Bim” Fernandez, who counts Rihanna as one of her role models, already has an original canvas by the Spanish master hanging above her bed in her Manhattan pied-à-terre. The 24-year-old beauty doesn’t need to aspire to a life of wealth and luxury. She is the daughter of Nigerian gemstone tycoon Antonio Deinde Fernandez, who Bim says is worth a staggering $8.7 billion. Her privileged background might raise the hackles of many a cash-strapped artist struggling to break into the music industry, but Fernandez insists: “Money can’t buy a record deal. SMH Records clearly thought she fit into the former category. The Charlotte, NCbased label signed her last fall, and Fernandez’s first release, the single “Let’s Take It Naked,” debuts Tuesday at smhworldwide.net.